Telegram which is arguably one of the best social messaging app at the moment has just released a new update for Android and iOS users. As usual, the new update come packed with a lot of new features and improvements. Also, a new “Invite Friends” category has been added to the Contacts menu, so you will now see all your friends who don't use Telegram but have many friends who do, on top of the list so that you can invite them faster and easier. 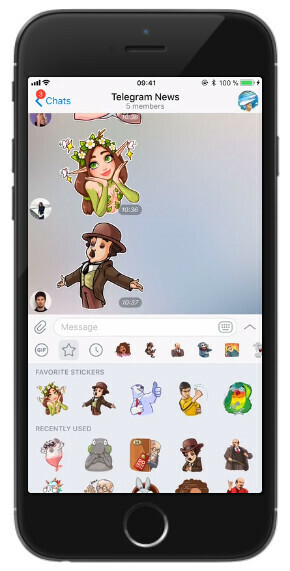 Telegram has also added a new feature in the latest update which makes users with up to 5 or more sticker sets installed to mark individual stickers as ‘favorites’, and have them always accessible at the top of the sticker panel in the ‘star’ section. Also, large groups with 100 or more members can now choose an official sticker set for all the members. This official sticker set will be available for all members to use while chatting in the group — without the need of adding it to their panels. >> Twitch videos are now supported in the Telegram in-app player, so you can watch Twitch streams in Picture-in-Picture mode while chatting with your friends. >> When on a Telegram voice call, you can now check the signal strength thanks to the new indicator. >> On iOS, you can edit any photo you pasted directly to a chat from clipboard before sending. >> On Android, when forwarding a message, you can long tap to select multiple recipients. >> On Android, if you have many new messages in many active chats, synchronization will happen much, much faster. The new telegram version 4.3 is already available on Google play store for Android users and on App store for iOS users.